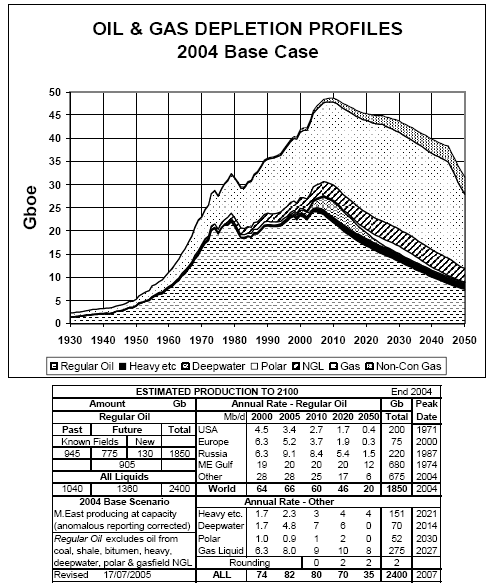 Peak Oil Debunked: 65. WHAT ABOUT THE U.S. NATURAL GAS "CLIFF"? 2) LNG facilities are being constructed to import natural gas. The U.S. will handle its natural gas peak in much the same manner that it handled its crude oil peak in 1971. It will import natural gas. Also, we should note that South Korea and Japan, both industrial powerhouses, function perfectly well despite having ZERO natural gas reserves. They already fell off the cliff and are on the ground, but it's not causing them any problems. Of course, the doomers are going to say: When are we going to start doing all this stuff? The cliff is imminent! If we don't get those gas imports, we're all going to die!! Well, first of all, we're not all going to die. Just the Americans. The so-called natural gas "cliff" is an American problem, and I'm not worried about it in the slightest because I live in Japan. Secondly, yes, there may be delays in investment, which will cause the price of natural gas in the U.S. to skyrocket. What should be done about that? My suggestion to the doomers is to get a clue, and cut down their usage. Of course, they can't do that because their doctrine states that conservation will collapse the economy, and is not a viable option due to Jevons Paradox. So I guess they'll just have to live with those big natural gas bills. *) Thanks to khebab for the sharp eye in noticing the change in ASPO's forecast. PO Doomers are the only people not to cut back when things get tight. 99% of other people do this naturally without much consideration as a response to higher prices/less resources. For example, a person has $10 to buy food for the week, what do they buy? Well, it's not a bottle of wine and truffles. More likely they make it stretch, bread, pasta, rice etc. Likewise when oil prices rise people will look at trading in 15mpg cars for 60 and 70mpg cars if they need them to cut down on costs. Since NG has been largely used in manufacturing all along (and not a sudden substitiute for oil), a good post to do in the future would be to see what uses are driving the increased demand for NG, so that opportunities for conversation and/or replacement with other fuelstocks can be brainstormed. On Jevon's Paradox: The primary driver of the Peak Oil problem is automobile transport. Most auto use is for commuting. So if I doubled the efficiency of a common car from 20 to 40 MPG, does that mean the commuter will double the diatnce for their commute? No. While some of the gains might be used up by living farther away from their place of work or extra vacations (which probably wouldn't grow much due to the limited amount of vacation days that Americans get), there is an overall decrease in energy use. Besides, with oil prices trending higher for rest of its existence, I think most people would like to drive less anyway, by living closer to work. I don't understand - NGL was in the older model as well. They seem to have added natural gas (ie. 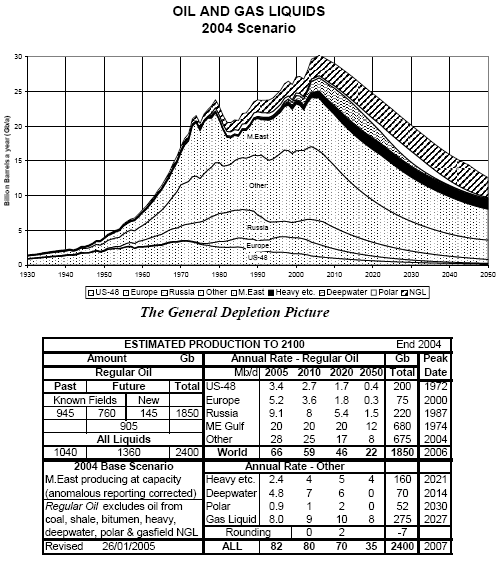 the gas, not the liquids) into the new model as well, which is extra data, but it doesn't affect the accuracy of the original model and still shows the same overall peak date. So why are you treating it like some sort of error or conspiracy ? also: I strongly recommend looking into the Transition Movement by Rob Hopkins for solutions and answers.